Are you a super organised go-getter? Business skills are incredibly useful and sought after across a range of industries. From administration to leadership roles, our courses in business can help you reach new heights in your career. People looking to aquire new skills to progress their career in business. This entry-level qualification allows individuals across a variety of industry sectors to develop basic skills and knowledge to prepare for work. They may undertake a range of simple tasks under close supervision. Familiarise yourself with the technology used in business. 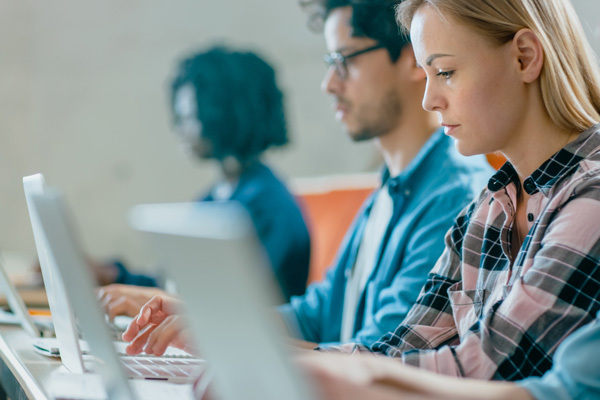 This qualification provides the skills and knowledge needed to safely perform foundation digital literacy tasks using a pc and a range of software applications and digital devices. A Certificate II in Business will guide you to the attainment of basic administrative skills necessary for employment across all industries in a wide range of roles. Students will learn basic office administration, undertake keyboarding and develop fundamental skills using Microsoft Office and the internet. Progress your career with the knowledge and skills required to take responsibility, provide advice and apply judgement. This qualification is ideal for applicants seeking to step up into mid-level business administration and customer support roles. Do you know your stuff and have the ability to apply your know-how effectively in support of those around you? This qualification is for administrators ready to use some discretion and judgement and provide technical advice and support to a team. Sign up today to receive news and updates about Far North Training & Consultancy. Thank you for signing up to our newsletter. Keep an eye out in your inbox for your first newsletter soon!